Volunteer Church School teachers and assistants, as well as the Crib Room child care professionals. 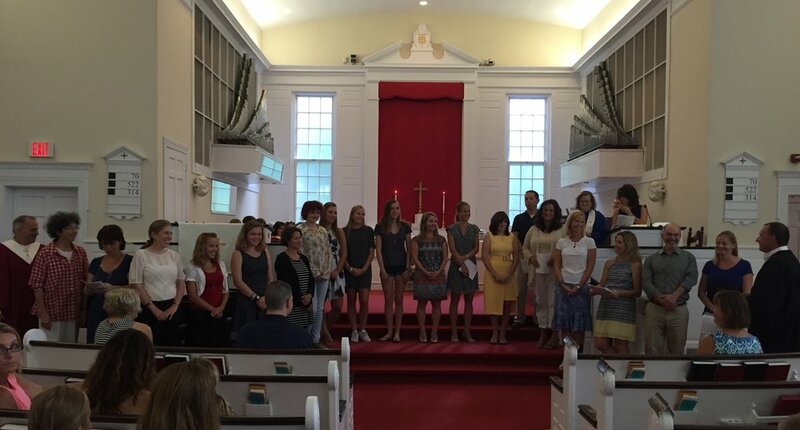 First Congregational Church of Westfield offers a vibrant Church School program that encourages children to learn and grow in their faith. A committed and hardworking team of professionals and volunteers provide a popular and ever growing and evolving church school experience to our youth. Our "Crib Room" is staffed every Sunday of the year by our dedicated paid professional care-givers. Parents of crib room aged children are also asked to assist on a rotating basis. Throughout the school year, a Senior High School Student is also assigned to assist in the Crib Room. There are always at least two adults present during worship. The Crib Room provides parents of young children peace of mind and the ability to enjoy the worship service knowing their child is receiving excellent care. Children attend worship with their parents and are dismissed for Church School after the children's moment, "The Word with Children." Beginning in September, we launched our new story-based sequential curriculum that runs from Genesis through the New Testament. We offer a broad view of the entire Bible sequentially in a three year cycle. It is felt that by offering a chronological story-based curriculum, the children will be more engaged and they will come to better understand how the stories of the Bible relate to one another. We also feel that a story-based curriculum will help kids better remember the major themes and examples of the Bible. Our curriculum will continue to emphasize learning and loving God, and caring for each other, their family and friends, and God’s world. After the “Word For Children,” all of the children and teachers will meet in Patton to hear the Bible story of the day. Sometimes the teachers will read the story and sometimes we will have a Mystery Guest Reader! Then, the kids will go to their classrooms to do an age related activity which reinforces the story. We have three age groups: 3 years – Grade 2, Grades 3-6 and Grades 7-9. Students in Grades 1-8 will attend Church School after the Word for Children as usual. However, the hymn that is usually sung after the Word for Children will be moved to right after the morning’s Message. During that hymn, the children in Grades 1-8 will be escorted back into the Sanctuary by their teachers in order to rejoin their families for the start of Communion. This will allow us to make that transition without adding time to the service and with the least amount of possible disruption. Middle High Students will remain in Worship on Communion Sundays in order to hear the Message. If you have any questions or concerns, please contact me. I am extremely excited about this new approach, and am confident that you will appreciate and support this opportunity to incorporate as many of our children as is considered appropriate into this foundational spiritual practice. One of the defining features of this faith community as I have come to know it is that we are deeply committed to our kids, and truly see their faith development as belonging to all of us. Music classes - children learn songs and hymns related to the curriculum. Under the direction of Assistant Music Director Joe Regan, the children also perform a special musical presentation during a worship service in the spring and at the Advent Festival in December. Christmas Eve pageant - children take part in a Christmas themed play during our 5pm service on Christmas Eve. Lenten Mission Project - children raise money through a "Fill the Ark" program and a very successful Cake Auction for the benefit of Heifer International. Bibles - Third grade students receive Bibles during a special service in the fall of each year. Confirmation - Ninth grade students attend Confirmation classes with the Ministers throughout the year for the purpose of exploring their faith at a deeper level than ever before. Confirmation Sunday is held in June. During June, July and August, Summer Sunday Stories, a one-room schoolhouse styled program is offered to school aged children, 3 years old - grade 5. Our senior high school students, when they are not volunteering in our Church School classrooms, remain in church so that they can experience worship. It is by worshiping together that we teach our youth the value of it. All 9th Grade students are invited to participate in this special year of exploring faith in greater depth through films and music; learning about the fascinating, puzzling, funny, challenging and powerfully life-changing stories of the Bible; visits to other Christian and non-Christian places of worship; time spent working on outreach issues; sharing in meals, concerts, movies and games; and joining together for at least one overnight retreat. Many of our sessions throughout the year will take place from 11:30 am – 12:30 pm on Sundays. However, there will also be a number of occasions when an activity will require getting together on other days and times. If you have any questions or concerns, please contact Mark or Joy at any time. Get ready to think, move, feel, work, laugh and grow! Each month’s tentative schedule will be printed in the Congregationalist that becomes available at the end of the previous month, as well as emailed to students and parents. Monetary donations to be used to purchase needed supplies throughout the year. Alida Woods joined the First Congregational Church with her family in November 1986. In February 1992, Alida was hired as the Church School Superintendent. She is responsible for all of the administrative tasks that are necessary for running the Church School. Alida is also responsible for identifying, recruiting, supervising and supporting our volunteer Church School teachers and assistants, as well as the Crib Room child care professionals. Alida received a Bachelor of Business Administration degree in Marketing from the George Washington University in 1981. Alida and her husband, Bill Woods, reside in Scotch Plains. They have two daughters. Sara and her husband, Ryan Mikulsky, reside in Gainesville, VA, and Christina resides in Scotch Plains.